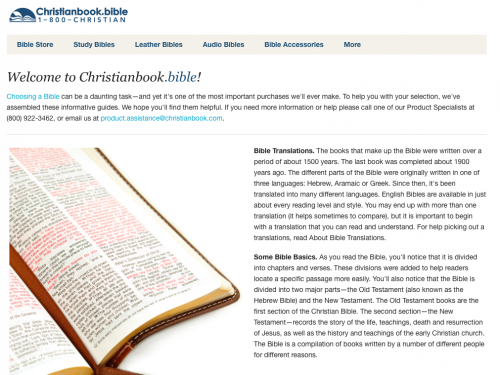 Christianbook.Bible is a content rich, informational site that seeks to educate our visitors on the different styles, types and translations of Bibles. Choosing a Bible can be an overwhelming task to some individuals—and yet it’s one of the most important purchases a person will ever make. To help visitors make the best choice, Christianbook.Bible offers an informative, friendly narrative of tools to make that choice as easy as possible. This includes informative guides addressing such topics as font size, an overview of the various translations, bindings, and types of Bibles—such as devotional, study, compact, journaling, etc. Christianbook.Bible will help all visitors, especially first time readers, to navigate what can be an otherwise daunting task. This could be the most significant purchase someone can make, and Christianbook.Bible wants to help them take the guesswork out of finding the best Bible available for them. Read more about how Christianbook.Bible helps people with choosing the perfect Bible for them.